The Tang Dynasty ( ; Middle Chinese: dhɑng) (June 18, 618 – June 4, 907) was an imperial dynasty of China preceded by the Sui Dynasty and followed by the Five Dynasties and Ten Kingdoms Period. It was founded by the Li family, who seized power during the decline and collapse of the Sui Empire. The dynasty was interrupted briefly by the Second Zhou Dynasty (October 16, 690 – March 3, 705) when Empress Wu Zetian seized the throne, becoming the first and only Chinese empress regnant, ruling in her own right. The Tang Dynasty, with its capital at Chang'an (present-day Xi'an ), the most populous city in the world at the time, is regarded by historians as a high point in Chinese civilization — equal to or surpassing that of the earlier Han Dynasty — as well as a golden age of cosmopolitan culture. Its territory, acquired through the military campaigns of its early rulers, was greater than that of the Han period, and it rivaled that of the later Yuan Dynasty , Ming Dynasty and Qing Dynasty . The enormous Grand Canal of China, built during the previous Sui Dynasty, facilitated the rise of new urban settlements along its route as well as increased trade between mainland Chinese markets. The canal is to this day the longest in the world. In two censuses of the 7th and 8th centuries, the Tang records stated that the population (by number of registered households) was about 50 million people. However, even when the central government was breaking down and unable to compile an accurate census of the population in the 9th century, it is estimated that the population in that century had grown to the size of about 80 million people. With its large population base, the dynasty was able to raise professional and conscripted armies of hundreds of thousands of troops to contend with nomadic powers in dominating Inner Asia and the lucrative trade routes along the Silk Road. Various kingdoms and states paid tribute to the Tang court, while the Tang also conquered or subdued several regions which it indirectly controlled through a protectorate system. Besides political hegemony, the Tang also exerted a powerful cultural influence over neighboring states such as those in Korea and Japan . In Chinese history, the Tang Dynasty was largely a period of progress and stability, except during the An Shi Rebellion and the decline of central authority in the latter half of the dynasty. Like the previous Sui Dynasty, the Tang Dynasty maintained a civil service system by drafting officials through standardized examinations and recommendations to office. This civil order was undermined by the rise of regional military governors known as jiedushi during the 9th century. Chinese culture flourished and further matured during the Tang era; it is considered the greatest age for Chinese poetry. Two of China's most famous historical poets, Du Fu and Li Bai, belonged to this age, as well as the poets Meng Haoran, Du Mu, and Bai Juyi. Many famous visual artists lived during this era, such as the renowned painters Han Gan, Zhang Xuan, and Zhou Fang. There was a rich variety of historical literature compiled by scholars, as well as encyclopedias and books on geography. There were many notable innovations during the Tang, including the development of woodblock printing, the government compilations of materia medica, improvements in cartography and the application of hydraulics to power air conditioning fans. The religious and philosophical ideology of Buddhism became a major aspect of Chinese culture, with native Chinese sects becoming the most prominent. However, Buddhism would eventually be persecuted by the state and would decline in influence. 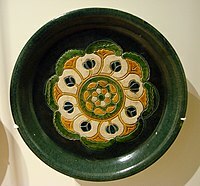 Although the dynasty and central government were in decline by the 9th century, art and culture continued to flourish. The weakened central government largely withdrew from managing the economy, but the country's mercantile affairs stayed intact and commercial trade continued to thrive regardless. The Li family belonged to the northwest military aristocracy prevalent during the reign of the Sui emperors. The mothers of both Emperor Yang of Sui (r. 604-617) and the founding emperor of Tang were sisters, making these two emperors of different dynasties first cousins. Li Yuan (later to become Emperor Gaozu of Tang, r. 618-626) was the Duke of Tang and former governor of Taiyuan when other government officials were fighting off bandit leaders in the collapse of the Sui Empire, caused in part by a failed Korean campaign. With prestige and military experience, he later rose in rebellion along with his son Li Shimin (later Emperor Taizong, r. 626-649) and his equally militant daughter Princess Pingyang (d. 623) who raised her own troops and commanded them. In 617, Li Yuan occupied Chang'an and acted as regent over a puppet child emperor of the Sui, relegating Emperor Yang to the position of Taishang Huang, or retired emperor/father of the present emperor. With the news of Emperor Yang's murder by his general Yuwen Huaji (d. 619), on June 18, 618, Li Yuan declared himself the emperor of a new dynasty, the Tang. Li Yuan ruled until 626 before being forcefully deposed by his son Li Shimin, Prince of Qin. Li Shimin had commanded troops since the age of 18, had prowess with a bow, sword, lance, and was known for his effective cavalry charges. Fighting a numerically superior army, he defeated Dou Jiande (573-621) at Luoyang in the Battle of Hulao on May 28, 621. In a violent elimination of royal family due to fear of assassination, Li Shimin ambushed and killed two of his brothers, Li Yuanji (b. 603) and Crown Prince Li Jiancheng (b. 589) in the Incident at Xuanwu Gate on July 2, 626. Shortly thereafter, his father abdicated in his favor and Li Shimin ascended the throne. He is conventionally known by his temple name Taizong (唐太宗). Although killing two brothers and deposing his father contradicted the Confucian value of filial piety, Taizong showed himself to be a capable leader who listened to the advice of the wisest members of his council. In 628, Emperor Taizong held a Buddhist memorial service for the casualties of war, and in 629 had Buddhist monasteries erected at the sites of major battles so that monks could pray for the fallen on both sides of the fight. This was during the campaign against Eastern Tujue, a Göktürk khanate that was destroyed after the capture of Jiali Khan Ashini Duobi by the famed Tang military officer Li Jing (571-649), who later became a Chancellor of the Tang Dynasty. With this victory, the Turks accepted Taizong as their Khagan, or Great Khan , in addition to his rule as the Son of Heaven. Taizong set out to solve internal problems within the government which had constantly plagued past dynasties. Building upon the Sui legal code, he issued a new legal code that subsequent Chinese dynasties would model theirs upon, as well as neighboring polities in Vietnam , Korea , and Japan . The earliest law code to survive though was the one established in the year 653, which was divided into 500 articles specifying different crimes and penalties ranging from ten blows with a light stick, one hundred blows with a heavy rod, exile, penal servitude, or execution. The legal code clearly distinguished different levels of severity in meted punishments when different members of the social and political hierarchy committed the same crime. For example, the severity of punishment was different when a servant or nephew killed a master or an uncle than when a master or uncle killed a servant or nephew. The Tang Code was largely retained by later codes such as the early Ming Dynasty (1368-1644) code of 1397, yet there were several revisions in later times, such as improved property rights for women during the Song Dynasty (960-1279). The Tang had three departments (省, shěng), which were obliged to draft, review, and implement policies respectively. There were also six ministries (部, bù) under the administrations that implemented policy, each of which was assigned different tasks. These divisional state bureaus included the personnel administration, finance, rites, military, justice, and public works—an administrative model which would last until the fall of the Qing Dynasty (1644-1912). Although the founders of the Tang related to the glory of the earlier Han Dynasty (202 BC-220 AD), the basis for much of their administrative organization was very similar to the previous Southern and Northern Dynasties. The Northern Zhou (557-581) divisional militia (fubing) was continued by the Tang government, along with farmer-soldiers serving in rotation from the capital or frontier in order to receive appropriated farmland. The equal-field system of the Northern Wei Dynasty (386-534) was also kept, although there were a few modifications. The center of the political power of the Tang was the capital city of Chang'an (modern Xi'an ), where the emperor maintained his large palace quarters, and entertained political emissaries with music, sports, acrobatic stunts, poetry, paintings, and dramatic theater performances. The capital was also filled with incredible amounts of riches and resources to spare. When the Chinese prefectural government officials traveled to the capital in the year 643 to give the annual report of the affairs in their districts, Emperor Taizong discovered that many had no proper quarters to rest in, and were renting rooms with merchants. Therefore, Emperor Taizong ordered the government agencies in charge of municipal construction to build every visiting official his own private mansion in the capital. Following the Sui Dynasty's example, the Tang abandoned the nine-rank system in favor of a large civil service system. Students of Confucian studies were potential candidates for the imperial examinations, the graduates of which could be appointed as state bureaucrats in the local, provincial, and central government. There were two types of exams that were given, mingjing ('illuminating the classics examination') and jinshi ('presented scholar examination'). The mingjing was based upon the Confucian classics, and tested the student's knowledge of a broad variety of texts. The jinshi tested a student's literary abilities in writing essay-style responses to questions on matters of governance and politics, as well as their skills in composing poetry. Candidates were also judged on their skills of deportment, appearance, speech, and level of skill in calligraphy, all of which were subjective criteria that allowed the already wealthy members of society to be chosen over ones of more modest means who were unable to be educated in rhetoric or fanciful writing skills. There was a disproportionate number of civil officials coming from aristocratic as opposed to non-aristocratic families. The exams were open to all male subjects whose fathers were not of the artisan or merchant classes, although having wealth or noble status was not a prerequisite in receiving a recommendation. In order to promote widespread Confucian education, the Tang government established state-run schools and issued standard versions of the Five Classics with selected commentaries. Nevertheless, the Sui and Tang dynasties institutionalized and set the foundations for the civil service system and this new elite class of exam-drafted scholar-officials. From the outset, religion played a role in Tang politics. In his bid for power, Li Yuan had attracted a following by claiming descent from the Daoist sage Laozi (fl. 6th century BC). People bidding for office would have monks from Buddhist temples pray for them in public in return for cash donations or gifts if the person was to be selected. Before the persecution of Buddhism in the 9th century, Buddhism and Daoism were accepted side by side, and Emperor Xuanzong of Tang (r. 712-756) invited monks and clerics of both religions to his court. At the same time Xuanzong exalted the ancient Laozi by granting him grand titles, wrote commentary on the Daoist Laozi, set up a school to prepare candidates for examinations on Daoist scriptures, and called upon the Indian monk Vajrabodhi (671-741) to perform Tantric rites to avert a drought in the year 726. In 742 Emperor Xuanzong personally held the incense burner during the ceremony of the Ceylonese monk Amoghavajra (705-774) reciting "mystical incantations to secure the victory of Tang forces." While religion played a role in politics, politics also played a role in religion. In the year 714, Emperor Xuanzong forbade shops and vendors in the city of Chang'an to sell copied Buddhist sutras, instead giving the Buddhist clergy of the monasteries the sole right to distribute sutras to the laity. In the previous year of 713, Emperor Xuanzong had liquidated the highly lucrative Inexhaustible Treasury, which was run by a prominent Buddhist monastery in Chang'an. This monastery collected vast amounts of money, silk, and treasures through multitudes of anonymous people's repentances, leaving the donations on the monastery's premise. Although the monastery was generous in donations, Emperor Xuanzong issued a decree abolishing their treasury on grounds that their banking practices were fraudulent, collected their riches, and distributed the wealth to various other Buddhist monasteries, Daoist abbeys, and to repair statues, halls, and bridges in the city. The Tang Dynasty government attempted to create an accurate census of the size of their empire's population, mostly for effective taxation and matters of military conscription for each region. The early Tang government established both the grain tax and cloth tax at a relatively low rate for each household under the empire. This was meant to encourage households to enroll for taxation and not avoid the authorities, thus providing the government with the most accurate estimate possible. In the census of 609, the population was tallied by efforts of the government at a size of 9 million households, or about 50 million people. Again, the Tang census of the year 742 approximated the size China's population to about 50 million people. Patricia Ebrey writes that even if a rather significant number of people had avoided the registration process of the tax census, the population size during the Tang had not grown significantly since the earlier Han Dynasty (the census of the year 2 recording a population of roughly 58 million people in China). S.A.M. Adshead disagrees, estimating that there were about 75 million people by 750. In the Tang census of the year 754, there were 1,859 cities, 321 prefectures, and 1,538 counties throughout the empire. Although there were many large and prominent cities during the Tang, the rural and agrarian areas comprised the majority of China's population at some 80 to 90 percent. There was also a dramatic migratory shift of the population from northern to southern China, as the North held 75% of the overall population at the dynasty's inception, but by its end was reduced to 50%. Chinese population size would not dramatically increase until the Song Dynasty period, where the population doubled to 100 million people due to extensive rice cultivation in central and southern China, coupled with rural farmers holding more abundant yields of food that they could easily provide the growing market. 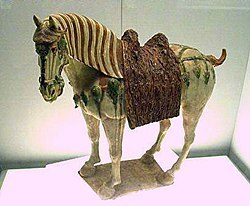 The 7th century and first half of the 8th century is generally considered the zenith era of the Tang Dynasty. Emperor Tang Xuanzong brought the Middle Kingdom to its golden age while the Silk Road thrived, with sway over Indochina in the south, and to the west Tang China was master of the Pamirs (modern-day Tajikistan ) and protector of Kashmir bordering Persia. Some of the kingdoms paying tribute to the Tang Dynasty included Kashmir , Nepal , Khotan , Kucha , Kashgar , Japan , Korea , Champa, and kingdoms located in Amu Darya and Syr Darya valley. Turkic nomads addressed the Emperor of Tang China as Tian Kehan. After the widespread Göktürk revolt of Shabolüe Khan (d. 658) was put down at Issyk Kul in 657 by Su Dingfang (591-667), Emperor Gaozong established several protectorates governed by a Protectorate General or Grand Protectorate General, which extended the Chinese sphere of influence as far as Herat in Western Afghanistan. Protectorate Generals were given a great deal of autonomy to handle local crises without waiting for central admission. After Xuanzong's reign, military governors (jiedushi) were given enormous power, including the ability to maintain their own armies, collect taxes, and pass their titles on hereditarily. This is commonly recognized as the beginning of the fall of Tang's central government. By the year 737, Emperor Xuanzong discarded the policy of conscripting soldiers that were replaced every three years, replacing them with long-service soldiers who were more battle-hardened and efficient. It was more economically feasible as well, since training new recruits and sending them out to the frontier every three years drained the treasury. By the late 7th century, the fubing troops began abandoning military service and the homes provided to them in the equal-field system. The supposed standard of 100 mu of land alotted to each family was in fact decreasing in size in places where population expanded and the wealthy bought up most of the land. Hard-pressed peasants and vagrants were then induced into military service with benefits of exemption from both taxation and corvée labor service, as well as provisions for farmland and dwellings for dependents who accompanied soldiers on the frontier. By the year 742 the total number of enlisted troops in the Tang armies had risen to about 500,000 men. The Sui and Tang carried out very successful military campaigns against the steppe nomads. Chinese foreign policy to the north and west now had to deal with Turkic nomads, who were becoming the most dominant ethnic group in Central Asia. To handle and avoid any threats posed by the Turks, the Sui government repaired fortifications and received their trade and tribute missions. They sent royal princesses off to marry Turkic clan leaders, a total of four of them in 597, 599, 614, and 617. The Sui stirred trouble and conflict amongst ethnic groups against the Turks. As early as the Sui Dynasty, the Turks had become a major militarized force employed by the Chinese. When the Khitans began raiding northeast China in 605, a Chinese general led 20,000 Turks against them, distributing Khitan livestock and women to the Turks as a reward. On two occasions between 635 to 636, Tang royal princesses were married to Turk mercenaries or generals in Chinese service. Throughout the Tang Dynasty until the end of 755, there were approximately ten Turkic generals serving under the Tang. While most of the Tang army was made of fubing Chinese conscripts, the majority of the troops led by Turkic generals were of non-Chinese origin, campaigning largely in the western frontier where the presence of fubing troops was low. Some "Turkic" troops were nomadisized Han Chinese, a desinicized people. While the Turks were settled in the Ordos region (former territory of the Xiongnu), the Tang government took on the military policy of dominating the central steppe. Like the earlier Han Dynasty, the Tang Dynasty (along with Turkic allies) conquered and subdued Central Asia during the 640s and 650s. During Emperor Taizong's reign alone, large campaigns were launched against not only the Göktürks, but also separate campaigns against the Tuyuhun, the Tufan, the Xiyu states, and the Xueyantuo. The Tang Empire fought with the Tibetan Empire for control of areas in Inner and Central Asia, which was at times settled with marriage alliances such as the marrying of Princess Wencheng (d. 680) to Songtsän Gampo (d. 649). There was a long string of conflicts with Tibet over territories in the Tarim Basin between 670-692 and in 763 the Tibetans even captured the capital of China, Chang'an , for fifteen days during the An Shi Rebellion. In fact, it was during this rebellion that the Tang withdrew its western garrisons stationed in what is now Gansu and Qinghai , which the Tibetans then occupied along with the territory of what is now Xinjiang. Hostilities between the Tang and Tibet continued until they signed a formal peace treaty in 821. The terms of this treaty, including the fixed borders between the two countries, are recorded in a bilingual inscription on a stone pillar outside the Jokhang temple in Lhasa. During the Islamic conquest of Persia (633-656), the son of the last ruler of the Sassanid Empire, Prince Pirooz, fled to Tang China. According to the Book of Tang, Pirooz was made the head of a Governorate of Persia in what is now Zaranj , Afghanistan . During this conquest of Persia, the Islamic Caliph Uthman Ibn Affan (r. 644-656) sent an embassy to the Tang court at Chang'an. By the 740s, the Arabs of Khurasan had established a presence in the Ferghana basin and in Sogdiana. At the Battle of Talas in 751, Qarluq mercenaries under the Chinese defected, which forced Tang commander Go Seonji (d. 756, also known as Gao Xianzhi, a general of Goguryeo descent) to retreat. Although the battle itself was not of the greatest significance militarily, this was a pivotal moment in history; it marks the spread of Chinese papermaking into regions west of China, ultimately reaching Europe by the 12th century. Although they had fought at Talas, on June 11, 758, an Abbasid embassy arrived at Chang'an simultaneously with the Uyghur Turks in order to pay tribute. From even further west, a tribute embassy came to the court of Taizong in 643 from the Patriarch of Antioch. In the east, the Chinese military campaigns were less successful than elsewhere. Like the emperors of the Sui Dynasty before him, Taizong established a military campaign in 644 against the Korean kingdom of Goguryeo in the Goguryeo-Tang Wars; however, this led to its defeat in the First Goguryeo–Tang War. Allying with the Korean Silla Kingdom, the Chinese fought against Baekje and their Yamato Japanese allies in the Battle of Baekgang in August of 663, a decisive Tang–Silla victory. The Tang Dynasty navy had several different ship types at its disposal to engage in naval warfare, these ships described by Li Quan in his Taipai Yinjing (Canon of the White and Gloomy Planet of War) of 759. The Battle of Baekgang was actually a restoration movement by remnant forces of Baekje, since their kingdom was toppled in 660 by a joint Tang–Silla invasion, led by notable Korean general Kim Yushin (595-673) and Chinese general Su Dingfang. In another joint invasion with Silla, the Tang army severely weakened the Goguryeo Kingdom in the north by taking out its outer forts in the year 645. With joint attacks by Silla and Tang armies under commander Li Shiji (594-669), the Kingdom of Goguryeo was destroyed by 668. Although they were formerly enemies, the Tang accepted officials and generals of Goguryeo into their administration and military, such as the brothers Yeon Namsaeng (634-679) and Yeon Namsan (639-701). From 668 to 676, the Tang Empire would control northern Korea. However, in 671 Silla began fighting the Tang forces there. At the same time the Tang faced threats on its western border when a large Chinese army was defeated by the Tibetans on the Dafei River in 670. By 676, the Tang army was driven out of Korea by Unified Silla. Following a revolt of the Eastern Turks in 679, the Tang abandoned its Korean campaigns. Although the Tang had fought the Japanese, they still held cordial relations with Japan. There were numerous Imperial embassies to China from Japan, diplomatic missions that were not halted until 894 by Emperor Uda (r. 887-897), upon persuasion by Sugawara no Michizane (845-903). The Japanese Emperor Temmu (r. 672-686) even established his conscripted army on that of the Chinese model, his state ceremonies on the Chinese model, and constructed his palace at Fujiwara on the Chinese model of architecture. Many Chinese Buddhist monks came to Japan to help further the spread of Buddhism as well. Two 7th century monks in particular, Zhi Yu and Zhi You, visited the court of Emperor Tenji (r. 661-672), whereupon they presented a gift of a South Pointing Chariot that they had crafted. This 3rd century mechanically-driven directional-compass vehicle (employing a differential gear) was again reproduced in several models for Tenji in 666, as recorded in the Nihon Shoki of 720. Japanese monks also visited China; such was the case with Ennin (794-864), who wrote of his travel experiences including travels along China's Grand Canal. The Japanese monk Enchin (814-891) stayed in China from 839 to 847 and again from 853 to 858, landing near Fuzhou, Fujian and setting sail for Japan from Taizhou, Zhejiang during his second trip to China. Through use of the land trade along the Silk Road and maritime trade by sail at sea, the Tang were able to gain many new technologies, cultural practices, rare luxury, and contemporary items. From the Middle East, India, Persia, and Central Asia the Tang were able to acquire new ideas in fashion, new types of ceramics, and improved silver-smithing. The Chinese also gradually adopted the foreign concept of stools and chairs as seating, whereas the Chinese beforehand always sat on mats placed on the floor. To the Middle East, the Islamic world coveted and purchased in bulk Chinese goods such as silks, lacquerwares, and porcelain wares. Songs, dances, and musical instruments from foreign regions became popular in China during the Tang Dynasty. These musical instruments included oboes, flutes, and small lacquered drums from Kucha in the Tarim Basin, and percussion instruments from India such as cymbals. At the court there were nine musical ensembles (expanded from seven in the Sui Dynasty) representing music from throughout Asia. There was great contact and interest in India as a hub for Buddhist knowledge, with famous travelers such as Xuanzang (d. 664) visiting the South Asian subcontinent. After a 17-year long trip, Xuanzang managed to bring back valuable Sanskrit texts to be translated into Chinese. There was also a Turkic–Chinese dictionary available for serious scholars and students, while Turkic folksongs gave inspiration to some Chinese poetry. In the interior of China, trade was facilitated by the Grand Canal and the Tang government's rationalization of the greater canal system that reduced costs of transporting grain and other commodities. The state also managed roughly of postal service routes by horse or boat. The Silk Road was the most important pre-modern Eurasian trade route. During this period of the Pax Sinica, the Silk Road reached its golden age, whereby Persian and Sogdian merchants benefited from the commerce between East and West. At the same time, the Chinese empire welcomed foreign cultures, making the Tang capital arguably the most cosmopolitan area in the world. Although the Silk Road from China to the West was initially formulated during the reign of Emperor Wu of Han (141-87 BC), it was reopened by the Tang in 639 when Hou Junji (d. 643) conquered the West, and remained open for almost four decades. It was closed after the Tibetans captured it in 678, but in 699, during Empress Wu's period, the Silk Road reopened when the Tang reconquered the Four Garrisons of Anxi originally installed in 640, once again connecting China directly to the West for land-based trade. The Tang captured the vital route through the Gilgit Valley from Tibet in 722, lost it to the Tibetans in 737, and regained it under the command of the Goguryeo-Korean General Gao Xianzhi. After the An Shi Rebellion ended in 763, the Tang Empire had once again lost control over many of its outer western lands, as the Tibetan Empire largely cut off China's direct access to the Silk Road. An internal rebellion in 848 ousted the Tibetan rulers, while Tang China regained its western territories from Tibet in 851, which contained crucial grazing areas and pastures for raising horses that the Tang Dynasty desperately needed. Despite the many western travelers coming into China to live and trade, many travelers, mainly religious monks, recorded the strict border laws that the Chinese enforced. As the monk Xuanzang and many other monk travelers attested to, there were many Chinese government checkpoints along the Silk Road that examined travel permits into the Tang Empire. Furthermore, banditry was a problem along the checkpoints and oasis towns, as Xuanzang also recorded that his group of travelers were assaulted by bandits on multiple occasions. Chinese envoys had been sailing through the Indian Ocean to India since perhaps the 2nd century BC, yet it was during the Tang Dynasty that a strong Chinese maritime presence could be found in the Persian Gulf and Red Sea , into Persia , Mesopotamia (sailing up the Euphrates River in modern-day Iraq ), Arabia, Egypt , Aksum (Ethiopia ), and Somalia in the Horn of Africa. From the same Quraysh tribe of Muhammad, Sa'd ibn Abi-Waqqas sailed from Ethiopia to China during the reign of Emperor Gaozu. He later traveled back to China with a copy of the Quran, establishing China's first mosque, the Mosque of Remembrance, during the reign of Emperor Gaozong. To this day he is still buried in a Muslim cemetery at Guangzhou . During the Tang Dynasty, thousands of foreigners came and lived in numerous Chinese cities for trade and commercial ties with China, including Persians, Arabs, Hindu Indians, Malays, Sinhalese, Khmers, Chams, Jews and Nestorian Christians of the Near East, and many others. In 748, the Buddhist monk Jian Zhen described Guangzhou as a bustling mercantile center where many large and impressive foreign ships came to dock. He wrote that "many big ships came from Borneo , Persia, Qunglun (Indonesia /Java )...with...spices, pearls, and jade piled up mountain high", as written in the Yue Jue Shu (Lost Records of the State of Yue). After Arab and Persian pirates burned and looted Guangzhou in 758, the Tang government reacted by shutting the port down for roughly five decades, as foreign vessels docked at Hanoi instead. However, when the port reopened it continued to thrive. In 851 the Arab merchant Suleiman al-Tajir observed the manufacturing of Chinese porcelain in Guangzhou and admired its transparent quality. He also provided a description of Guangzhou's mosque, its granaries, its local government administration, some of its written records, the treatment of travellers, along with the use of ceramics, rice-wine, and tea. However, in another bloody episode at Guangzhou in 879, the Chinese rebel Huang Chao sacked the city, and purportedly slaughtered thousands of native Chinese, along with foreign Jews, Christians, and Muslims in the process. Huang's rebellion was eventually suppressed in 884. Vessels from Korean Silla, Balhae and Hizen Province of Japan were all involved in the Yellow Sea trade, which Silla dominated. After Silla and Japan reopened renewed hostilities in the late 7th century, most Japanese maritime merchants chose to set sail from Nagasaki towards the mouth of the Huai River, the Yangzi River, and even as far south as the Hangzhou Bay in order to avoid Korean ships in the Yellow Sea. In order to sail back to Japan in 838, the Japanese embassy to China procured nine ships and sixty Korean sailors from the Korean wards of Chuzhou and Lianshui cities along the Huai River. It is also known that Chinese trade ships traveling to Japan set sail from the various ports along the coasts of Zhejiang and Fujian provinces. The Chinese engaged in large-scale production for overseas export by at least the time of the Tang. This was proven by the discovery of a silt-preserved shipwrecked Arab dhow in the Gaspar Strait near Belitung , which had 63,000 pieces of Tang gold, silver, and ceramics (including a Changsha bowl inscribed with a date: "16th day of the seventh month of the second year of the Baoli reign", or 826 AD, roughly confirmed by radiocarbon dating of star anise at the wreck). Beginning in 785, the Chinese began to call regularly at Sufala on the East African coast in order to cut out Arab middlemen, with various contemporary Chinese sources giving detailed descriptions of trade in Africa. The official and geographer Jia Dan (730-805) wrote of two common sea trade routes in his day: one from the coast of the Bohai Sea towards Korea and another from Guangzhou through Malacca towards the Nicobar Islands , Sri Lanka and India, the eastern and northern shores of the Arabian Sea to the Euphrates River. In 863 the Chinese author Duan Chengshi (d. 863) provided a detailed description of the slave trade, ivory trade, and ambergris trade in a country called Bobali, which historians suggest was Berbera in Somalia . In Fustat (old Cairo ), Egypt, the fame of Chinese ceramics there led to an enormous demand for Chinese goods; hence Chinese often traveled there (this continued into later periods such as Fatimid Egypt). From this time period, the Arab merchant Shulama once wrote of his admiration for Chinese seafaring junk, but noted that their draft was too deep for them to enter the Euphrates River, which forced them to ferry passengers and cargo in small boats. Shulama also noted that Chinese ships were often very large, with capacities up to 600-700 passengers. Although she entered Emperor Gaozong's court as the lowly consort Wu Zhao, Wu Zetian would rise to the highest seat of power in 690, establishing the short-lived later Zhou Dynasty. Empress Wu's rise to power was achieved through cruel and calculating tactics. For example, she allegedly killed her own baby girl and blamed it on Gaozong's empress so that the empress would be demoted. Emperor Gaozong suffered a stroke in 655, and Wu began to make many of his court decisions for him, discussing affairs of state with his councilors that would take orders from her while she sat behind a screen. When Empress Wu's eldest son and crown prince began to assert his authority and announce his support for issues that were opposed to Empress Wu's ideas, he suddenly died in 675. Many suspected he was poisoned by Empress Wu. Although the next heir apparent kept a lower profile, in 680 he was accused by Wu of plotting a rebellion and was banished (and later forced to commit suicide). After only six weeks on the throne in 683, Emperor Zhongzong was deposed by Empress Wu after his attempt to appoint his wife's father as chancellor. Because she dominated the court of Emperor Ruizong (r. 684-690), a group of Tang princes and their allies staged a major rebellion against Empress Wu in 684; her armies suppressed their dissent within two months. Becoming China's first female emperor in 690 upon her son's forced abdication, she ruled until shortly before her death in 705, deposed by her own retainers while her designated heir became Emperor Zhongzong again. In order to legitimize her rule, she circulated a document known as the Great Cloud Sutra, which predicted that a reincarnation of the Maitreya Buddha would be a female monarch who would dispel illness, worry, and disaster from the world. She even introduced numerous revised written characters to the written language, which reverted back to the originals after her death. Arguably the most important part of her legacy was diminishing the power of the northwest aristocracy, allowing people from other clans and regions of China to become more representative in Chinese politics and government. There were many prominent women at court during and after Wu's reign, including Shangguan Wan'er (664-710), a female poet, writer, and trusted official in charge of Wu's private office. 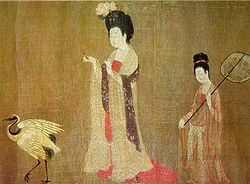 In 706 the wife of Emperor Zhongzong of Tang, Empress Wei (d. 710), convinced her husband to staff government offices with his sister and her daughters, and in 709 requested that he grant women the right to bequeath hereditary privileges to their sons (which before was a male right only). Empress Wei eventually poisoned Zhongzong, whereupon she placed his fifteen year old son upon the throne in 710. Two weeks later, Li Longji (the later Emperor Xuanzong) entered the palace with a few followers and slew Empress Wei and her faction. He then installed his father Emperor Ruizong (r. 710-712) on the throne. Just as Emperor Zhongzong was dominated by Empress Wei, so too was Ruizong dominated by Princess Taiping. This was finally ended when Princess Taiping's coup failed in 712 (she later hanged herself in 713) and Emperor Ruizong abdicated to Emperor Xuanzong. During the 44 year reign of Emperor Xuanzong, the Tang Dynasty was brought to its height, a golden age, a period of low economic inflation, as well as a toning down of the excessively lavish lifestyle of the imperial court. Seen as a progressive and benevolent ruler, Xuanzong even abolished the death penalty in the year 747, and all executions had to be approved beforehand by the emperor himself (which was relatively few, considering that there were only 24 executions in the year 730 alone). Xuanzong bowed to the consensus of his ministers on policy decisions and made efforts to fairly staff government ministries with different political factions. His staunch Confucian chancellor Zhang Jiuling (673-740) worked to reduce deflation and increase the money supply by upholding the use of private coinage, although his aristocratic and technocratic successor Li Linfu (d. 753) favored government monopoly over the issuance of coinage. After 737 most of Xuanzong's confidence rested in his long-standing chancellor Li Linfu, who championed a more aggressive foreign policy employing non-Chinese generals. This policy ultimately created the conditions for a massive rebellion against Xuanzong. The Tang Empire was at its height of power up until the middle of the 8th century, when the An Shi Rebellion (December 16, 755 - February 17, 763) destroyed the prosperity of the empire. 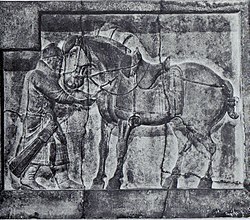 An Lushan was a half-Sogdian, half-Turk Tang commander since 744, had experience fighting the Khitans of Manchuria with a victory in 744, yet most of his campaigns against the Khitans were unsuccessful. He was given great responsibility in Hebei , which allowed him to rebel with an army of more than one hundred thousand troops. After capturing Luoyang, he named himself emperor of a new, but short-lived, Yan Dynasty. Despite early victories scored by Tang General Guo Ziyi (697-781), the newly recruited troops of the army at the capital were no match for An Lushan's die-hard frontier veterans, so the court fled Chang'an. While the heir apparent raised troops in Shanxi and Xuanzong fled to Sichuan province, they called upon the help of the Uyghur Turks in 756. The Uyghur khan Moyanchur was greatly excited at this prospect, and married his own daughter to the Chinese diplomatic envoy once he arrived, receiving in turn a Chinese princess as his bride. The Uyghurs helped recapture the Tang capital from the rebels, but they refused to leave until the Tang paid them an enormous sum of tribute in silk. Even Abbasid Arabs assisted the Tang in putting down An Lushan's rebellion. The Tibetans took hold of the opportunity and raided many areas under Chinese control, and even after the Tibetan Empire had fallen apart in 842 (and the Uyghurs soon after) the Tang were in no position to reconquer Central Asia after 763. So significant was this loss that half a century later jinshi examination candidates were required to write an essay on the causes of the Tang's decline. Although An Lushan was killed by one of his eunuchs in 757, this time of troubles and widespread insurrection continued until rebel Shi Siming was killed by his own son in 763. One of the legacies that the Tang government left since 710 was the gradual rise of regional military governors, the jiedushi, who slowly came to challenge the power of the central government. After the An Shi Rebellion, the autonomous power and authority accumulated by the jiedushi in Hebei went beyond the central government's control. After a series of rebellions between 781 and 784 in today's Hebei, Shandong , Hubei and Henan provinces, the government had to officially acknowledge the jiedushi's hereditary ruling without accreditation. The Tang government relied on these governors and their armies for protection and to suppress locals that would take up arms against the government. In return, the central government would acknowledge the rights of these governors to maintain their army, collect taxes and even to pass on their title to heirs. As time passed, these military governors slowly phased out the prominence of civil officials drafted by exams, and became more autonomous from central authority. The rule of these powerful military governors lasted until 960, when a new civil order under the Song Dynasty was established. Also, the abandonment of the equal-field system meant that people could buy and sell land freely. Many poor fell into debt because of this, forced to sell their land to the wealthy, which led to the exponential growth of large estates. With the breakdown of the land allocation system after 755, the central Chinese state barely interfered in agricultural management and acted merely as tax collector for roughly a millennium, save a few instances such as the Song's failed land nationalization during the 13th century war with the Mongols. With the central government collapsing in authority over the various regions of the empire, it was recorded in 845 that bandits and river pirates in parties of 100 or more began plundering settlements along the Yangtze River with little resistance. In 858, enormous floods along the Grand Canal inundated vast tracts of land and terrain of the North China Plain, which drowned tens of thousands of people in the process. Chinese belief in the Mandate of Heaven granted to the ailing Tang was also challenged when natural calamities occurred, forcing many to believe the Heavens were displeased and that the Tang had lost their right to rule. Then in 873 a disastrous harvest shook the foundations of the empire; in some areas only half of all agricultural produce was gathered, and tens of thousands faced famine and starvation. In the earlier period of the Tang, the central government was able to meet crises in the harvest, as it was recorded from 714-719 that the Tang government responded effectively to natural disasters by extending the price-regulation granary system throughout the country. The central government was able then to build a large surplus stock of foods to ward off the rising danger of famine and increased agricultural productivity through land reclamation. In the 9th century, however, the Tang government was nearly helpless in dealing with any calamity. The last great ambitious ruler of the Tang Dynasty was Emperor Xianzong of Tang (r. 805-820), his reign period aided by the fiscal reforms of the 780s, including the government monopoly on the salt industry. He also had an effective well trained imperial army stationed at the capital led by his court eunuchs; this was the Army of Divine Strategy, numbering 240,000 in strength as recorded in 798. Between the years 806 and 819, Emperor Xianzong conducted seven major military campaigns to quell the rebellious provinces that had claimed autonomy from central authority, managing to subdue all but two of them. Under his reign there was a brief end to the hereditary jiedushi, as Xianzong appointed his own military officers and staffed the regional bureaucracies once again with civil officials. However, Xianzong's successors proved less capable and more interested in the leisure of hunting, feasting, and playing outdoor sports, allowing eunuchs to amass more power as drafted scholar-officials caused strife in the bureaucracy with factional parties. The eunuchs' power became unchallenged after Emperor Wenzong of Tang's (r. 826-840) failed plot to have them overthrown; instead the allies of Emperor Wenzong were publicly executed in the West Market of Chang'an, by the eunuchs' command. In addition to natural calamities and jiedushi amassing autonomous control, the Huang Chao Rebellion (874-884) resulted in the sacking of both Chang'an and Luoyang, and took an entire decade to suppress. Although the rebellion was defeated by the Tang, it never recovered from that crucial blow, weakening it for the future military powers to take over. There were also large groups of bandits, in the size of small armies, that ravaged the countryside in the last years of the Tang, who smuggled illicit salt, ambushed merchants and convoys, and even besieged several walled cities. A certain Zhu Wen (originally a salt smuggler) who had served under the rebel Huang had later surrendered to Tang forces, his military merit in betraying and defeating Huang's forces meaning rapid military promotions for him. In 907, after almost 300 years in power, the dynasty was ended when this military governor, Zhu Wen (known soon after as Taizu of Later Liang), deposed the last emperor of Tang, Emperor Ai of Tang, and took the throne for himself. He established his Later Liang Dynasty, which thereby inaugurated the Five Dynasties and Ten Kingdoms Period. A year later, the deposed Emperor Ai was poisoned to death by Zhu Wen. Although cast in a negative light by many for usurping power from the Tang, Zhu Wen turned out to be a skilled administrator. Emperor Taizu of Later Liang was also responsible for the building of a large seawall, new walls and roads for the burgeoning city of Hangzhou , which would later become the capital of the Southern Song Dynasty. Much more than earlier periods, the Tang era was an era renowned for its time reserved for leisure activity, especially for those in the upper classes. Many outdoor sports and activities were enjoyed during the Tang, including archery, hunting, horse polo, cuju football, cockfighting, and even tug of war. Government officials were granted vacations during their tenure in office. Officials were granted 30 days off every three years to visit their parents if they lived away, or 15 days off if the parents lived more than away (travel time not included). Officials were granted nine days of vacation time for weddings of a son or daughter, and either five, three, or one days/day off for the nuptials of close relatives (travel time not included). Officials also received a total of three days off for their son's capping initiation rite into manhood, and one day off for the ceremony of initiation rite of a close relative's son. Although Chang'an was the site for the capital of the earlier Han and Jin dynasties, after subsequent destruction in warfare, it was the Sui Dynasty model that comprised the Tang era capital. The roughly-square dimensions of the city had six miles (10 km) of outer walls running east to west, and more than five miles (8 km) of outer walls running north to south. From the large Mingde Gates located mid-center of the main southern wall, a wide city avenue stretched from there all the way north to the central administrative city, behind which was the Chentian Gate of the royal palace, or Imperial City. Intersecting this were fourteen main streets running east to west, while eleven main streets ran north to south. These main intersecting roads formed 108 rectangular wards with walls and four gates each, and each ward filled with multiple city blocks. The city was made famous for this checkerboard pattern of main roads with walled and gated districts, its layout even mentioned in one of Du Fu's poems. During the Heian period, the city of Heian kyō (present-day Kyoto) of Japan like many cities was arranged in the checkerboard street grid pattern of the Tang capital and in accordance with traditional geomancy following the model of Chang'an. Of these 108 wards in Chang'an, two of them (each the size of two regular city wards) were designated as government-supervised markets, and other space reserved for temples, gardens, ponds, etc. Throughout the entire city, there were 111 Buddhist monasteries, 41 Daoist abbeys, 38 family shrines, 2 official temples, 7 churches of foreign religions, 10 city wards with provincial transmission offices, 12 major inns, and 6 graveyards. Some city wards were literally filled with open public playing fields or the backyards of lavish mansions for playing horse polo and cuju football. The Tang capital was the largest city in the world at its time, the population of the city wards and its suburban countryside reaching 2 million inhabitants. The Tang capital was very cosmopolitan, with ethnicities of Persia , Central Asia, Japan, Korea, Vietnam , Tibet, India, and many other places living within. Naturally, with this plethora of different ethnicities living in Chang'an, there were also many different practiced religions, such as Buddhism, Nestorian Christianity, Manichaeism, Zoroastrianism, Judaism, and Islam being practiced within. With widely open access to China that the Silk Road to the west facilitated, many foreign settlers were able to move east to China, while the city of Chang'an itself had about 25,000 foreigners living within. Exotic green-eyed, blond-haired Tocharian ladies serving wine in agate and amber cups, singing, and dancing at taverns attracted customers. If a foreigner in China pursued a Chinese woman for marriage, he was required to stay in China and was unable to take his bride back to his homeland, as stated in a law passed in 628 to protect women from temporary marriages with foreign envoys. There was also the secondary capital city of Luoyang , which was the favored capital of the two by Empress Wu. In the year 691 she had more than 100,000 families (more than 500,000 people) from around the region of Chang'an move to populate Luoyang instead. With a population of about a million, Luoyang became the second largest capital in the empire, and with its close proximity to the Luo River it benefited from southern agricultural fertility and trade traffic of the Grand Canal. However, the Tang court eventually demoted its capital status and did not visit Luoyang after the year 743, when Chang'an's problem of acquiring adequate supplies and stores for the year was solved. As early as 736, granaries were built at critical points along the route from Yangzhou to Chang'an, which eliminated shipment delays, spoilage, and pilfering. An artificial lake used as a transshipment pool was dredged east of Chang'an in 743, where curious northerners could finally see the array of boats found in southern China, delivering tax and tribute items to the imperial court. The Tang period was a golden age of Chinese literature and art. There are over 48,900 poems penned by some 2,200 Tang authors that have survived until modern times. Perfecting one's skills in the composition of poetry became a required study for those wishing to pass imperial examinations, while poetry was also heavily competitive; poetry contests amongst esteemed guests at banquets and courtiers of elite social gatherings was common in the Tang period. Poetry styles that were popular in the Tang included gushi and jintishi, with the renowned Tang poet Li Bai (701-762) famous for the former style, and Tang poets like Wang Wei (701-761) and Cui Hao (704-754) famous for their use of the latter. Jintishi poetry, or regulated verse, is in the form of eight-line stanzas or seven character per line with a fixed pattern of tones that required the second and third couplets to be antithetical (although the antithesis is often lost in translation to other languages). Tang poems in particular remain the most popular out of every historical era of China. This great emulation of Tang era poetry began in the Song Dynasty; in that period, Yan Yu (嚴羽; active 1194-1245) asserted that he was the first to designate the poetry of the High Tang (c. 713-766) era as the orthodox material with "canonical status within the classical poetic tradition." Yan Yu reserved the position of highest esteem among all Tang poets for Du Fu (712-770), who was not viewed as such in his own era, and was branded by his peers as an anti-traditional rebel. There were other important literary forms besides poetry during the Tang period. There was Duan Chengshi's (d. 863) Miscellaneous Morsels from Youyang, an entertaining collection of foreign legends and hearsay, reports on natural phenomena, short anecdotes, mythical and mundane tales, as well as notes on various subjects. The exact literary category or classification that Duan's large informal narrative would fit into is still debated amongst scholars and historians. Short story fiction and tales were also popular during the Tang, one of the more famous ones being Yingying's Biography by Yuan Zhen (779-831), which was widely circulated in his own time and by the Yuan Dynasty (1279-1368) became the basis for plays in Chinese opera. Timothy C. Wong places this story within the wider context of Tang love tales, which often share the plot designs of quick passion, inescapable societal pressure leading to the abandonment of romance, followed by a period of melancholy. Wong states that this scheme lacks the undying vows and total self-commitment to love found in Western romances such as Romeo and Juliet, but that underlying traditional Chinese values of inseparableness of self from one's environment (including human society) served to create the necessary fictional device of romantic tension. There were large encyclopedias published in the Tang. The Yiwen Leiju encyclopedia was compiled in 624 by the chief editor Ouyang Xun (557-641) as well as Linghu Defen (582-666) and Chen Shuda (d. 635). The encyclopedia Treatise on Astrology of the Kaiyuan Era was fully compiled in 729 by Gautama Siddha (fl. 8th century), an ethnic Indian astronomer, astrologer, and scholar born in the capital Chang'an. Chinese geographers such as Jia Dan wrote accurate descriptions of places far abroad. In his work written between 785 and 805, he described the sea route going into the mouth of the Persian Gulf , and that the medieval Iranian (whom he called the people of Luo-He-Yi) had erected 'ornamental pillars' in the sea that acted as lighthouse beacons for ships that might go astray. Confirming Jia's reports about lighthouses in the Persian Gulf, Arabic writers a century after Jia wrote of the same structures, writers such as al-Mas'udi and al-Muqaddasi. The Tang Dynasty Chinese diplomat Wang Xuance traveled to Magadha (modern northeastern India ) during the 7th century. Afterwards he wrote the book Zhang Tianzhu Guotu (Illustrated Accounts of Central India), which included a wealth of geographical information. The Classical Prose Movement was spurred large in part by the writings of Tang authors Liu Zongyuan (773-819) and Han Yu (768-824). This new prose style broke away from the poetry tradition of the 'piantiwen' style begun in the ancient Han Dynasty. Although writers of the Classical Prose Movement imitated 'piantiwen', they criticized it for its often vague content and lack of colloquial language, focusing more on clarity and precision to make their writing more direct. This guwen (archaic prose) style can be traced back to Han Yu, and would become largely associated with orthodox Neo-Confucianism. Since ancient times, the Chinese believed in a folk religion that incorporated many deities. The Chinese believed that the afterlife was a reality parallel to the living world, complete with its own bureaucracy and afterlife currency needed by dead ancestors. This is reflected in many short stories written in the Tang about people accidentally winding up in the realm of the dead, only to come back and report their experiences. Buddhism, originating in India around the time of Confucius, continued to flourish during the Tang period and was adopted by the imperial family, becoming thoroughly sinicized and a permanent part of Chinese traditional culture. In an age before Neo-Confucianism and figures such as Zhu Xi (1130-1200), Buddhism had begun to flourish in China during the Southern and Northern Dynasties, and became the dominant ideology during the prosperous Tang. Buddhist monasteries played an integral role in Chinese society, offering lodging for travelers in remote areas, schools for children throughout the country, and a place for urban literati to stage social events and gatherings such as going-away parties. Buddhist monasteries were also engaged in the economy, since their land property and serfs gave them enough revenues to set up mills, oil presses, and other enterprises. Although the monasteries retained 'serfs', these monastery dependents could actually own property and employ others to help them in their work, including their own slaves. The prominent status of Buddhism in Chinese culture began to decline as the dynasty and central government declined as well during the late 8th century to 9th century. Buddhist convents and temples that were exempt from state taxes beforehand were targeted by the state for taxation. In 845 Emperor Wuzong of Tang finally shut down 4,600 Buddhist monasteries along with 40,000 temples and shrines, forcing 260,000 Buddhist monks and nuns to return to secular life; this episode would later be dubbed one of the Four Buddhist Persecutions in China. Although the ban would be lifted just a few years after, Buddhism never regained its once dominant status in Chinese culture. This situation also came about through new revival of interest in native Chinese philosophies, such as Confucianism and Daoism. Han Yu (786-824)—who Arthur F. Wright stated was a "brilliant polemicist and ardent xenophobe"—was one of the first men of the Tang to denounce Buddhism. Although his contemporaries found him crude and obnoxious, he would foreshadow the later persecution of Buddhism in the Tang, as well as the revival of Confucian theory with the rise of Neo-Confucianism of the Song Dynasty. Nonetheless, Chán Buddhism gained popularity amongst the educated elite. There were also many famous Chan monks from the Tang era, such as Mazu Daoyi, Baizhang, and Huangbo Xiyun. The sect of Pure Land Buddhism initiated by the Chinese monk Huiyuan (334-416) was also just as popular as Chan Buddhism during the Tang. Rivaling Buddhism was Daoism, a native Chinese philosophical and religious belief system that found its roots in the book of the Daodejing (attributed to Laozi in the 6th century BC) and the Zhuangzi. The ruling Li family of the Tang Dynasty actually claimed descent from the ancient Laozi. On numerous occasions where Tang princes would become crown prince or Tang princesses taking vows as Daoist priestesses, their lavish former mansions would be converted into Daoist abbeys and places of worship. Many Daoists were associated with alchemy in their pursuits to find an elixir of immortality and a means to create gold from concocted mixtures of many other elements. Although they never achieved their goals in either of these futile pursuits, they did contribute to the discovery of new metal alloys, porcelain products, and new dyes. The historian Joseph Needham labeled the work of the Daoist alchemists as "proto-science rather than pseudo-science." However, the close connection between Daoism and alchemy, which some sinologists have asserted, is refuted by Nathan Sivin, who states that alchemy was just as prominent (if not more so) in the secular sphere and practiced more often by laymen. The Tang Dynasty also officially recognized various foreign religions. The Assyrian Church of the East, otherwise known as the Nestorian Christian Church, was given recognition by the Tang court. In 781, the Nestorian Stele was created in order to honor the achievements of their community in China. A Christian monastery was established in Shaanxi province where the Daqin Pagoda still stands, and inside the pagoda there is Christian-themed artwork. Although the religion largely died out after the Tang, it was revived in China following the Mongol invasions of the 13th century. Women's social rights and social status during the Tang era were incredibly liberal-minded for the medieval period. However, this was largely reserved for urban women of elite status, as men and women in the rural countryside labored hard in their different set of tasks; with wives and daughters responsible for more domestic tasks of weaving textiles and rearing of silk worms, while men tended to farming in the fields. There were many women in the Tang era who gained access to religious authority by taking vows as Daoist priestesses. The head mistresses of the bordellos in the North Hamlet of the capital Chang'an acquired large amounts of wealth and power. Their high-class courtesans, who likely influenced the Japanese geishas, were well respected. These courtesans were known as great singers and poets, supervised banquets and feasts, knew the rules to all the drinking games, and were trained to have the utmost respectable table manners. It was fashionable for women to be full-figured (or plump). Men enjoyed the presence of assertive, active women. 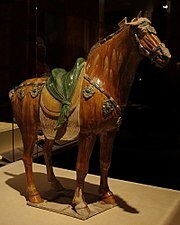 The foreign horse-riding sport of polo from Persia became a wildly popular trend amongst the Chinese elite, and women often played the sport (as glazed earthenware figurines from the time period portray). The preferred hairstyle for women was to bunch their hair up like "an elaborate edifice above the forehead," while affluent ladies wore extravagant head ornaments, combs, pearl necklaces, face powders, and perfumes. A law was passed in 671 which attempted to force women to wear hats with veils again in order to promote decency, but these laws were ignored as some women started wearing caps and even no hats at all, as well as men's riding clothes and boots, and tight-sleeved bodices. There were some prominent court women after the era of Empress Wu, such as Yang Guifei (719-756), who had Emperor Xuanzong appoint many of her relatives and cronies to important ministerial and martial positions. During the earlier Southern and Northern Dynasties (420-589), and perhaps even earlier, the drinking of tea became popular in southern China. (Tea comes from the leaf buds of Camelia sinensis, native to southwestern China.) Tea was viewed then as a beverage of tasteful pleasure and with pharmacological purpose as well. During the Tang Dynasty, tea became synonymous with everything sophisticated in society. The Tang poet Lu Tong (790-835) devoted most of his poetry to his love of tea. The 8th century author Lu Yu (known as the Sage of Tea) even wrote a treatise on the art of drinking tea, called the Classic of Tea (Chájīng). Tea was also enjoyed by Uyghur Turks; when riding into town, the first places they visited were the tea shops. Although wrapping paper had been used in China since the 2nd century BC, during the Tang Dynasty the Chinese were using wrapping paper as folded and sewn square bags to hold and preserve the flavor of tea leaves. Indeed, paper found many other uses besides writing and wrapping during the Tang era. Earlier, the first recorded use of toilet paper was made in 589 by the scholar-official Yan Zhitui (531-591), and in 851 an Arab Muslim traveler commented on how the Tang era Chinese were not careful about cleanliness because they did not wash with water when going to the bathroom; instead, he said, the Chinese simply used paper to wipe themselves. In ancient times, the Chinese had outlined the five most basic foodstuffs known as the five grains: sesamum, legumes, wheat, panicled millet, and glutinous millet. The Ming Dynasty encyclopedist Song Yingxing (1587-1666) noted that rice was not counted amongst the five grains from the time of the legendary and deified Chinese sage Shennong (the existence of whom Yingxing wrote was "an uncertain matter") into the 2nd millenniums BC, because the properly wet and humid climate in southern China for growing rice was not yet fully settled or cultivated by the Chinese. During the Tang, the many common foodstuffs and cooking ingredients in addition to those already listed were barley, garlic, salt, turnips, soybeans, pears, apricots, peaches, apples, pomegranates, jujubes, rhubarb, hazelnuts, pine nuts, chestnuts, walnuts, yam, taro, etc. The various meats that were consumed included pork, chicken, lamb (especially preferred in the north), sea otter, bear (which was hard to catch, but there were recipes for steamed, boiled, and marinated bear), and even Bactrian camels. In the south along the coast meat from seafood was by default the most common, as the Chinese enjoyed eating cooked jellyfish with cinnamon, Sichuan pepper, cardamom, and ginger, as well as oysters with wine, fried squid with ginger and vinegar, horseshoe crabs and red crab, shrimp, and pufferfish, which the Chinese called 'river piglet'. Some foods were also off-limits, as the Tang court encouraged people not to eat beef (since the bull was a valuable draft animal), and from 831 to 833 Emperor Wenzong of Tang even banned the slaughter of cattle on the grounds of his religious convictions to Buddhism. From the trade overseas and over land, the Chinese acquired golden peaches from Samarkand , date palm, pistachios, and figs from Persia, pine seeds and ginseng roots from Korea , and mangoes from Southeast Asia. In China, there was a great demand for sugar; during the reign of Harsha (r. 606-647) over North India, Indian envoys to Tang China brought two makers of sugar who successfully taught the Chinese how to cultivate sugarcane. Cotton also came from India as a finished product from Bengal , although it was during the Tang that the Chinese began to grow and process cotton, and by the Yuan Dynasty it became the prime textile fabric in China. Methods of food preservation were important and practiced throughout China. The common people used simple methods of preservation, such as digging deep ditches and trenches, brining, and salting their foods. The emperor had large ice pits located in the parks in and around Chang'an for preserving food, while the wealthy and elite had their own smaller ice pits. Each year the emperor had laborers carve 1000 blocks of ice from frozen creeks in mountain valleys, each block with the dimension of 0.91 m (3 ft) by 0.91 m by 1.06 m (3½ ft). There were many frozen delicacies enjoyed during the summer, especially chilled melon. Woodblock printing made the written word available to vastly greater audiences. One of the world's oldest surviving printed documents is a miniature Buddhist dharani sutra unearthed at Xi'an in 1974 and dated roughly from 650 to 670. 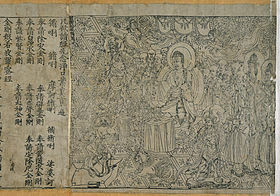 The Diamond Sutra is the first full-length book printed at regular size, complete with illustrations embedded with the text and dated precisely to 868. Among the earliest documents to be printed were Buddhist texts as well as calendars, the latter essential for calculating and marking which days were auspicious and which days were not. With so many books coming into circulation for the general public, literacy rates could improve, along with the lower classes being able to obtain cheaper sources of study. Therefore, there was more lower class people seen entering the Imperial Examinations and passing them by the later Song Dynasty. Although the later Bi Sheng's movable type printing in the 11th century was innovative for his period, woodblock printing that became widespread in the Tang would remain the dominant printing type in China until the more advanced printing press from Europe became widely accepted and used in East Asia. The first use of the playing card during the Tang Dynasty was an auxiliary invention of the new age of printing. Technology during the Tang period was built also upon the precedents of the past. The mechanical gear systems of Zhang Heng (78-139) and Ma Jun (fl. 3rd century) gave the Tang engineer, astronomer, and monk Yi Xing (683-727) inspiration when he invented the world's first clockwork escapement mechanism in 725. This was used alongside a clepsydra clock and waterwheel to power a rotating armillary sphere in representation of astronomical observation. Yi Xing's device also had a mechanically-timed bell that was struck automatically every hour, and a drum that was struck automatically every quarter hour; essentially, a striking clock. Yi Xing's astronomical clock and water-powered armillary sphere became well known throughout the country, since students attempting to pass the imperial examinations by 730 had to write an essay on the device as an exam requirement. However, the most common type of public and palace timekeeping device was the inflow clepsydra. Its design was improved c. 610 by the Sui-dynasty engineers Geng Xun and Yuwen Kai. They provided a steelyard balance that allowed seasonal adjustment in the pressure head of the compensating tank and could then control the rate of flow for different lengths of day and night. Although the use of a teasing mechanical puppet in this wine-serving device was certainly ingenious, the use of mechanical puppets in China date back to the Qin Dynasty (221-207 BC) while Ma Jun in the 3rd century had an entire mechanical puppet theater operated by the rotation of a waterwheel. There was also an automatic wine-server known in the ancient Greco-Roman world, a design of Heron of Alexandria that employed an urn with an inner valve and a lever device similar to the one described above. There are many stories of automatons used in the Tang, including general Yang Wulian's wooden statue of a monk who stretched his hands out to collect contributions; when the amount of coins reached a certain weight, the mechanical figure moved his arms to deposit them in a satchel. This weight-and-lever mechanism was exactly like Heron's penny slot machine. Other devices included one by Wang Ju, whose "wooden otter" could allegedly catch fish; Needham suspects a spring trap of some kind was employed here. The Chinese of the Tang era were also very interested in the benefits of officially classifying all of the medicines used in pharmacology. In 657, Emperor Gaozong of Tang (r. 649-683) commissioned the literary project of publishing an official materia medica, complete with text and illustrated drawings for 833 different medicinal substances taken from different stones, minerals, metals, plants, herbs, animals, vegetables, fruits, and cereal crops. In addition to compiling pharmacopeias, the Tang fostered learning in medicine by upholding imperial medical colleges, state examinations for doctors, and publishing forensic manuals for physicians. Authors of medicine in the Tang include Zhen Qian (d. 643) and Sun Simiao (581-682), the former who first identified in writing that patients with diabetes had an excess of sugar in their urine, and the latter who was the first to recognize that diabetic patients should avoid consuming alcohol and starchy foods. As written by Zhen Qian and others in the Tang, the thyroid glands of sheep and pigs were successfully used to treat goiters; thyroid extracts were not used to treat patients with goiter in the West until 1890. In the realm of technical Chinese architecture, there were also government standard building codes, outlined in the early Tang book of the Yingshan Ling (National Building Law). Fragments of this book have survived in the Tang Lü (The Tang Code), while the Song Dynasty architectural manual of the Yingzao Fashi (State Building Standards) by Li Jie (1065-1101) in 1103 is the oldest existing technical treatise on Chinese architecture that has survived in full. During the reign of Emperor Xuanzong of Tang (712-756) there were 34,850 registered craftsmen serving the state, managed by the Agency of Palace Buildings (Jingzuo Jian). In the realm of cartography, there were further advances beyond the map-makers of the Han Dynasty. When the Tang chancellor Pei Ju (547-627) was working for the Sui Dynasty as a Commercial Commissioner in 605, he created a well-known gridded map with a graduated scale in the tradition of Pei Xiu (224-271). The Tang chancellor Xu Jingzong (592-672) was also known for his map of China drawn in the year 658. In the year 785 the Emperor Dezong had the geographer and cartographer Jia Dan (730-805) complete a map of China and her former colonies in Central Asia. Upon its completion in 801, the map was 9.1 m (30 ft) in length and 10 m (33 ft) in height, mapped out on a grid scale of one inch equaling one hundred li (Chinese unit of measuring distance). A Chinese map of 1137 is similar in complexity to the one made by Jia Dan, carved on a stone stele with a grid scale of 100 li. However, the only type of map that has survived from the Tang period are star charts. Despite this, the earliest extant terrain maps of China come from the ancient State of Qin; maps from the 4th century BC that were excavated in 1986. The Chinese of the Tang period employed complex chemical formulas for an array of different purposes, often found through experiments of alchemy. These included a waterproof and dust-repelling cream or varnish for clothes and weapons, fireproof cement for glass and porcelain wares, a waterproof cream applied to silk clothes of underwater divers, a cream designated for polishing bronze mirrors, and many other useful formulas. The vitrified, translucent ceramic known as porcelain was invented in China during the Tang, although many types of glazed ceramics preceded it. Ever since the Han Dynasty (202 BC - 220 AD), the Chinese had drilled deep boreholes to transport natural gas from bamboo pipelines to stoves where cast iron evaporation pans boiled brine to extract salt. During the Tang Dynasty, a gazetteer of Sichuan province stated that at one of these 182 m (600 ft) 'fire wells', men collected natural gas into portable bamboo tubes which could be carried around for dozens of km (mi) and still produce a flame. These were essentially the first gas cylinders; Robert Temple assumes some sort of tap was used for this device. The first classic work about the Tang is the Book of Tang by Liu Xu (887-946) et al. of the Later Jin, who redacted it during the last years of his life. This was edited into another history (labelled the New Book of Tang) in order to distinguish it, which was a work by the Song historians Ouyang Xiu (1007-1072), Song Qi (998-1061), et al. of the Song Dynasty (between the years 1044 and 1060). Both of them were based upon earlier annals, yet those are now lost. Both of them also rank among the Twenty-Four Histories of China. One of the surviving sources of the Book of Tang, primarily covering up to 756, is the Tongdian, which Du You presented to the emperor in 801. The Tang period was again placed into the enormous universal history text of the Zizhi Tongjian, edited, compiled, and completed in 1084 by a team of scholars under the Song Dynasty Chancellor Sima Guang (1019-1086). This historical text, written with 3 million Chinese characters in 294 volumes, covered the history of China from the beginning of the Warring States (403 BC) until the beginning of the Song Dynasty (960).